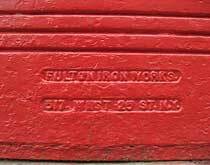 The Fulton Iron Works were also known as Blake, McMahon & Co. and later Blake & Duffy. Trow's New York City Copartnership Directory for 1879 lists John Blake, Thomas McMahon and John Mahoney as the partners at Blake, McMahon & Co. Trow's New York City Copartnership Directory for 1890 lists Thomas C. Blake and Francis Duffy as the partners at Blake & Duffy. The address of these companies was 517-519 W. 25th St., New York City, and they were in business at this address from 1878 to 1892. John Blake (1924?-?) was a junk dealer, age 36, born Ireland, in the 1860 U. S. Census, when he lived in New York City's 5th Ward. The same John Blake lived at 84 Laight St. (also in the 5th Ward), New York, in the 1870 census. By the time of the 1880 census, John Blake lived at 444 West 51st St., Manhattan, and reported his occupation as an iron dealer. John Blake does not appear in the 1900 U. S. census and probably died somewhere around 1887. He was joined by his son, Thomas C. Blake, at what was then Blake & Duffy, 517 W. 25th St., in Trow's New York city directory of 1884. Blake & Duffy was in business at 517-519 W. 25th St. until 1892. Thomas C. Blake (1859-1950) was John Blake's son, and he is found in seven successive U. S. census reports from 1860 through 1930. In 1860 he was 8 months old, in 1870 he was 11. In the 1880 census his age appears to be 17, he lived with his father, mother and three siblings, and his occupation was "clerk in store." By the 1900 census his occupation was lawyer, which it remained for the rest of his life. The 1900 census gives his birth date as Nov., 1859. In 1902 Thomas Blake was appointed an assistant in the office of the New York City Corporation Counsel (New York Times, 4 May 1902, p. 3). When Francis Duffy (1859-?) applied for a passport in 1882, he was 22 years old, born New York City, 11 Oct. 1859, and he asked that the passport be forwarded to Francis Duffy, Counselor at Law, P. O. Box 15, N. [?]. In the 1880 U. S. Census he was a law student, 20 years old, born New York, living with his mother, Annie E. Duffy, at 343 E. 84th St., Manhattan. He was listed in New York city directories as a lawyer living at 343 E. 84th St. from 1883 to 1884, then became "iron" at this address in 1885. His last listing in Trow's New York City Directory was in 1894. John Mahoney (1815?-?) was recorded in the U. S. Census of 1870 as John Mahon, a dock builder, age 55, born Ireland, living at 82 Laight St. in New York City's 5th Ward. This address was next door to John Blake who lived at 84 Laight St. Mahoney was in business with John Blake as junk dealers at 90 Laight St. from 1863 to 1876. Meanwhile Blake & Mahoney also became iron dealers at 137 Barrow St. in 1870. This business had a second location, 111 Morton St. (probably another entrance to the same property), and lasted until 1883. Mahoney was also a partner in the iron foundry, Blake, McMahon & Co., at 517-519 W. 25th St. from its inception in 1878. His last listing in Trow's New York City Directory was in 1883. Thomas McMahon (1830?-?) appeared in the U. S. Census of 1880, age 50, born New York, "Iron Foundry." His first appearance in New York city directories was in 1878, as a partner with John Blake (Blake, Mahon & Co.) at 519 W. 25th St. 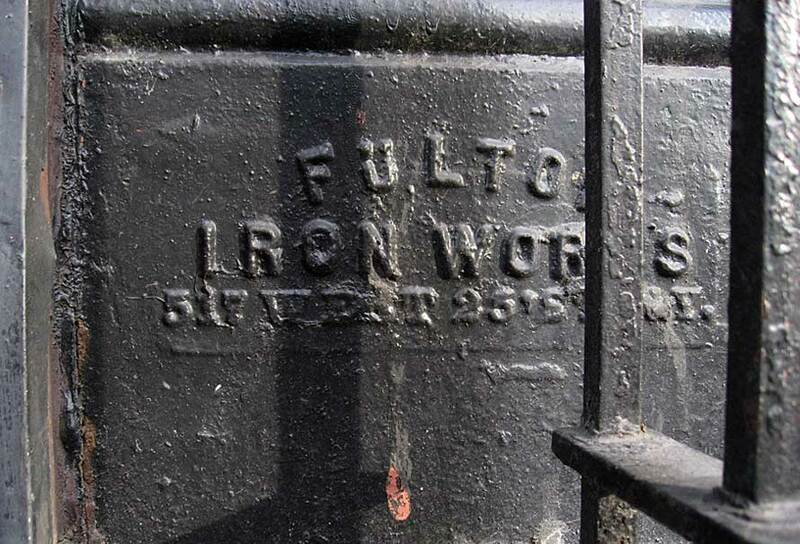 The business may have been known as Fulton Iron Works as early as this date. Like, John Mahoney, McMahon's last listing in Trow's New York City Directory was in 1883. 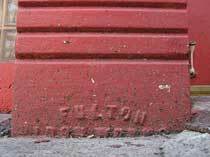 For Blake & Duffy foundry marks and a more extensive history of this company see the Blake & Duffy page.